Why do you think people let so many fruits and vegetables go to waste? What do you think can or should be done to stop people from wasting so many fruits and vegetables? 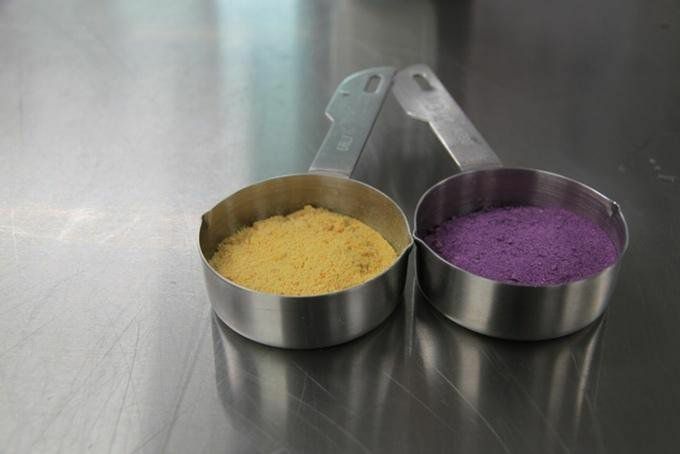 What do you think would be the advantage of having powdered fruits and vegetables? Is there any way that this type of food could be a disadvantage? Have you ever become aware of a have/have not situation such as this? Did you do something to help? If not, what do you wish you could have done? Instruct students to think about a typical school lunch. Tell them to focus not on what was served, but rather what they did and didn't eat. What percent of the school lunch, on average, do students think they waste in any given week? Multiply that figure by the number of students in the class. Then multiply by the number of students in the school. Discuss the results. Point out that many people waste food. On the other hand, many people live in a constant state of hunger. Draw students' attention back to their school lunches. Brainstorm ideas about how these unused food items could be redirected to feed people in need. Encourage students to talk with the cafeteria manager to learn how much of the school's food is unused or wasted on a daily basis. Find out what happens to that food. Perhaps your school already has a plan in place. If not, challenge students to create a plan of their own. Guide students as they create their plan. Suggest that they interview the cafeteria manager to learn more about the school's unused food. Tell them to contact local agencies for ideas about storing and distributing the food. Encourage students to seek guidance and incorporate advice from these and other experts as they fine-tune the details of their plan. Invite students to present their final plan to school leaders. Lobby for permission to turn the plan into a working program to feed hungry people in your local area. Guide the class as students investigate the issue and create one master plan. Invite experts, such as the cafeteria manager or the leader of a local food pantry, to visit the class and share their knowledge. Encourage students to ask relevant questions of each expert. Instruct students to conduct research to identify local experts on hunger. Invite these experts to visit the class and share their knowledge. Point that different types of foods are stored or handled in different ways. Encourage students to ask insightful questions to learn about food storage and distribution issues. As a class, identify key people to talk to and key issues that must be considered when developing a food redistribution plan. Divide the class into small groups. Assign each group one contact or issue. Encourage students to interview the person or conduct research about their specific issue. Rejoin as a class so students can share their information. Guide students as they combine the information to create one cohesive plan. As a class, identify key issues that must be considered when developing a food redistribution plan. Then encourage students to select a team of supervisors. Each supervisor will oversee a specific area of the plan. All other students will work in small groups in which they create a list of important questions, identify key contacts and conduct research to find the answers. You may wish to work with other classes or expand this into an all-school project. If students are able to get their final plan approved, encourage them to enlist the help of parents, siblings and other community members to get the program off the ground and keep it running on a regular basis. In this lesson, students search for answers to specific questions about prepared food products, including what a food is made from, the source of its ingredients and how the ingredients were grown. The lesson includes options for homework. In this lesson, students design a system of community-supported agriculture (CSA). The lesson includes such math applications as measurement and geometry. In this lesson, students analyze the "food system" in their community. They look for solutions to any ecological or social problems inherent in the system. This lesson plan encourages students to discuss issues of poverty and homelessness. In groups, they consider the challenges facing New Orleans and propose solutions. They research the viability of those solutions and create a business plan to make them possible.